Last year I had the pleasure of judging a wine competition in Puglia, Italy, along with the charming Anthony d’Anna of the Yarra Valley in Australia. Anthony told me that his family ran a wine merchant and importing business in Melbourne, specialising in Italian wines. But the family also own a vineyard estate called Hoddles Creek. 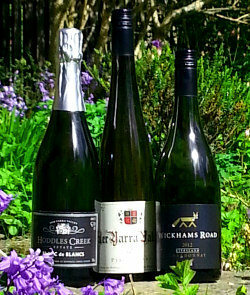 The wines are not imported into the UK, but following some rave reviews in Australian and US press, they have something of a cult following and sell out quickly on release. Anthony promised that he would send me a selection of their wines to try for myself and, true to his word, a package from Australia arrive containing six of the estate’s wines. 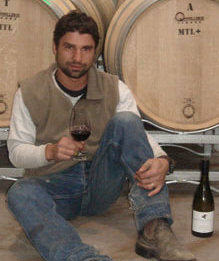 Anthony’s brother, Franco d’Anna (right) is winemaker at Hoddles Creek. Franco began helping out at the family liquor store aged 13, and by the age of 21 he was the store’s head wine buyer, while simultaneously obtaining a bachelor of commerce degree at Melbourne University. The family’s decision to plant a vineyard changed things however, and for Franco further study towards a postgraduate viticultural qualification from the Charles Sturt University followed. He then gained experience working at James Halliday’s Coldstream Hills before time spent shadowing experienced winemakers back at Hoddles Creek. Finally, Franco took over the winemaking reins. The d’Anna family estate is located in the Upper Yarra Valley, which is said to be “higher, cooler and more marginal,” than lower Yarra. Winemaking practises tend to be “minimal,” with all wines moved by gravity and normally no addition of acid or enzymes. No wine sees 100% oak – some cuvées seeing no new oak. For some lovers of Australian Chardonnay there’s a possibility these wines might be too lean, too nervy, but for me the wines are absolute standard bearers for the ‘new Australian Chardonnay’: taut, restrained, refined. At time of writing Hoddles Creek does not have a UK importer. But please see worldwide stockists on wine-searcher. Made from Chardonnay from the ‘Syberia’ block, their steepest and most elevated block, this traditional method sparkling wine stayed two years on the lees in bottle and has a lowly 2g/l sugar dosage. Terrific nose, here: authentic autolytic notes of brioche and hazelnut, yeasty and rich yet with a fresh star fruit and apple brightness. Soft, rolling and deliciously velvety mousse with a lovely flow of creamy ripe fruit all suffused with that touch of smokiness and nutty richness again. Delightful weight and a pillow of precise mousse, but pin sharp in the finish too with a touch of saltiness adding a gastronomic hue. Delicious. 91/100. $39.99 AUD. With only 12% alcohol and made in super-fresh, unoaked style, the nose of this screwcapped white offers a delightful medley of fresh and juicy pears with the subtlest of herbal and floral tones. In the mouth an initial impression of sweetness is soon driven through with a dry, apple core to the wine and plentiful acidity. This is crisp and flexibly food-friendly, and is both a touch austere and yet with summery appeal. If there is any criticism, perhaps I’d prefer just an extra ounce of palate weight. 89/100. $39.99 AUD. From Gippsland fruit the d’Annas buy in, approximately 30% was whole bunch pressed and fermented in cask with a combination of cultured and natural yeasts where it remained on the lees until November. It has a pale, straw/green colour and a delightfully fresh nose. There’s a wisp of flint, lots of lemon peel and apple skins, and just a whisper of nutty oatmeal. In the mouth it is finely-tuned, focused on those lean and limpid acid flavours and gentle texture, the support of the oak just adding a little flesh to the pithy lemon peel zest of the finish. Delicious and elegant for an entry level Chardonnay. 90/100. $16.99 AUD. From the three home blocks of Chardonnay on the Hoddles Creek estate, and aged in mostly older barrels for 11 months, this is super-lean on the nose, with a faintly green edge to the fruit and lots of saline minerality. In the mouth the dry, apple core and underripe melon character of the fruit is alive with citric acidity too, the merest glimpse of something a little fatter and peachier soon swept away in the salt and lemon of the finish. 90/90. $19.99 AUD. The top Chardonnay weighs in with 13.2% alcohol. There’s a lovely touch of something yeasty or lightly bready in a wine that really expresses that flinty, complex sulphide character of high quality young white Burgundy. Notes of preserved lemon and a taut sense of minerality too, but with a bit of density. On the palate the super-concentration of the fruit is delightful, a really intense quality of sweet-edged, ripe apple and waxy, lime-like concentration, a surge of acidity that feels very natural and again with that saline, mineral tang coming through to give both lift and savoury, umami depth to the wine. A superb Chardonnay this, with both massive presence and quite authority, yet it has charm and delicious fruit too. 93/100. $39.99 AUD. From and “almost ideal” vintage in Gippsland, this Pinot made from 13-year-old vines and spent eight months in large, older barrels. It has an absolutely entrancing nose, the essence of rippled, cocoa-dusted raspberries with a soft background of beetroot and briary tones. On the palate the sweetness of that creamy raspberry fruit is matched by a gentle floral delicacy, then the spicy, warming background of older oak, a touch chocolaty, but refined and supple, pushes in. A gorgeous and silky young Pinot this – and it makes me want to try the others in the range. 90-91/100. $19.99 AUD.